Students who attended the Goldfarb event received valuable insight about leadership and decision-making from two military commanders. 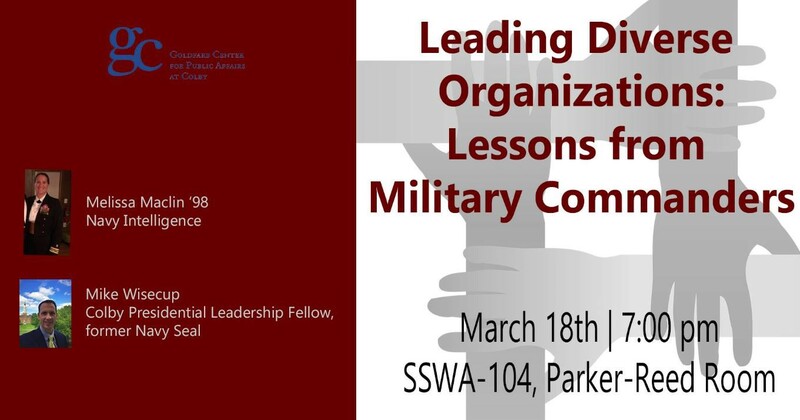 Students, professors and coaches piled into the Alumni Center’s Parker-Reed room to listen and contribute to a Goldfarb Center discussion called “Leading Diverse Organizations: Lessons from Military Commanders” on Monday, March 19. The event was introduced and moderated by Goldfarb Center Director Patrice Franko, who detailed the impressive careers of Melissa Maclin ’98 and Mike Wisecup before initiating a discussion-based forum. Maclin has held various officer positions within the Navy throughout her decades-long tenure, and Wisecup was a Navy Seal Officer until October 2018, working now as a Presidential Leadership Fellow at the College. The discussion was largely focused on how the speakers’ careers in positions of authority could be used as models for effective leadership strategies. The audience in attendance was noticeably athlete-heavy, and also included members of the administration, such as Dean of the College Karlene Burrell-McRae ’94, Dean of Students Inge-Lise Ameer and Athletic Director Jacob Olkkola. The talk featured a casual conversation between Franko, Wisecup, and Maclin. Franko began by asking broader questions about the personal lives of the two commanders, regularly opening up the discussion to questions from the audience before directing the conversation towards the operational intricacies of the military’s endeavors to kill al-Qaeda’s Osama bin Laden. Discussion surrounded the immediate aftermath of 9/11, since both commanders’ careers were in full-swing during that era. The two discussed their best character strengths in promoting inclusive leadership. Both commanders explained how curiosity is an integral quality in a leader. Wisecup elaborated that a leader’s curiosity allows him or her to find unique traits within his team, optimizing the effectiveness of each soldier. Maclin stressed the importance of providing the means for people to flourish in circumstances that make them most comfortable, rather than implementing a “one-size-fits-all approach.” Also, both commanders explained that much could be learned from the unique perspective of members of a team whom they outranked. The importance of a woman’s perspective was also highlighted by the commanders, as Maclin explained that being a woman within a male-dominated sphere helped her consider new perspectives that other officers had not thought about. The theme of trust returned multiple times throughout the conversation, with Wisecup emphasizing that keeping from marginalizing or alienating one’s group is one of the most substantial keys to cohesive success. If a leader is trusted, his team will be able to express their strengths openly, optimizing group effectiveness. Cassidy said that “I think one of the most important things they touched on was the danger of ego and personal interest when operating within a team. The most critical lesson I learned at OCS is that selfishness is the quickest way to lose trust and support from your peers. It’s a lesson that is ingrained in every military leader, no matter what rank.” Cassidy shares a connection with Maclin over their time in OCS, an intensive training process that they both graduated from successfully. Mike Wisecup will continue to be on campus throughout the semester as a Leadership Fellow.